The British project was working against the background of the successful French Yunnan–Vietnam railway that had been established on the nearby Hanoi to Kunming route from 1904–1910, some 30 years earlier. To secure the rights to construction, Britain referred to Article IV of the Anglo-French Siam Convention for ‘mutual privileges’. It seems as though there was an element of competition in the decision to proceed with the building of the line. Maria Bugrova‘s article The British expeditions to China in XIX century discusses the question of a railway to Yunnan from Burma. In the 1880s, Great Britain drew special attention to the Upper Burma region and the roads to southwestern China. The former colonial officer of British Burma‘s administration, A.R. Colquhoun, and an engineer of the Civil Works Department in India, H. Hallett, traveled in 1882 from Canton to Rangoon. A.R Colquhoun returned to England and sent his proposal to the Chamber of Commerce of Great Britain to investigate the question of building a railway between Rangoon and southwestern China through the Shan states. His proposal was approved by the Chamber. According to a preliminary calculation, the cost of work was about seven thousand pound sterling. One half of this amount had to be presented by the Chambers of Commerce, and another part had to be contributed by the Government. A railway, starting from Mandalay, goes north-east to the bank of the Salwin which is to be crossed at Kunlong Ferry in latitude 23 degrees 20′, whence, if ever built, it is to be taken north in Chinese territory and run parallel with the prevailing strike of the mountains, due north to Tali-fu; but this line will pass through a wild thinly-peopled country and it is doubtful if a private company will be found to build it. Research has resulted in a few images of the construction work coming to light. 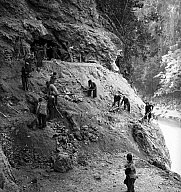 These images show work in and around the Nam-ting River Gorge in 1942. Unfortunately, it seems that construction of the line was abandoned due to Japanese advances, and was never resumed. Burma’s limited trading value to China and its internal political and military instability have probably been two major contributing factors. Today the Yunnan side of the line lies in ruin. Though signs here and there attest to its presence, there is little actual rail left, and the line has all but vanished from local history and barely graces itineraries of all but the most determined travellers. One such sign can be glimpsed opposite the ferry to Baodian, slightly south of Manwan in the far north-eastern section of Lincang prefecture. The sign records a tunnel from the construction, but the entry has long been covered over and there is no visual hint to the line’s presence whatsoever. So, although it initially appears as though this would be the natural location for the Garratts after leaving East Africa in 1939, our investigation suggests that it is actually very unlikely to have been their destination. If correct, this means that the British probably sold the Garratts to their erstwhile competitors in Indo-China – the French. The Yunnan–Haiphong railway is an 855 km (531mile) railway built by France between 1904–1910, connecting Haiphong, Vietnam with Kunming, Yunnan province, China. The section within China from Kunming to Hekou is known as the Kunming–Hekou railway, and is 466 km long. The section within Vietnam is 389 km (242 mile) long, and is known as the Hanoi–Lào Cai railway. The railway was built as a metre-gauge line due to the mountainous terrain along the route. Currently it is the only metre-gauge main line in China. In the 19th century, the French colonial administration worked to develop regular trading networks and an efficient transport infrastructure between Indo-china and south-west China. The primary motivation for such an effort was to facilitate export of European goods to China. A railway would also give France access to Yunnan’s natural resources, mineral resources and opium, and open up the Chinese market for Indochinese products such as rice, dry fish, wood and coal. Prior to the construction of the railway, the standard travel time from Haiphong (the closest sea port to most of Yunnan) to Kunming was reckoned by the Western authorities to be 28 days: 16 days by steamer and then a small boat up the Red River to Manhao (425 miles), and then 12 days overland (194 miles). The right to build the railway was obtained following China’s defeat in the First Sino-Japanese War (1894–95). At a cost of 95 million francs (€362 million), the railway was among the most ambitious colonial projects undertaken by France, and was put into use on 1 April 1910. 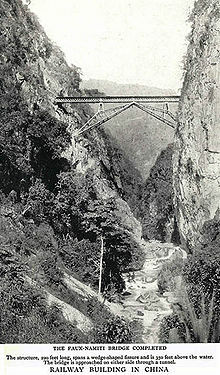 In the context of French technology and manufacturing over a century ago, the construction of a several-hundred-km long railroad through the red-earth mountain plateau of Yunnan called for political will allied with vision, courage and hard work; without these, one of the most magnificent projects in the history of railroad construction would not have been possible. This railroad represents the highest level of engineering technology in the early 20th century. For 80 percent of its length it runs between perilous and precipitous mountains. Within a linear” distance of 200km. Between Hekou at 76m above sea level to Mengzi at 2,000m above sea level, there is an altitude disparity of over 1,900m: the section between Baogu and Baizhai involves a climb of 1,200 m within just 44 km. In order to complete the project at the least time and cost, the Hekou to Kunming project was divided into 12 separate sections which were progressed simultaneously. 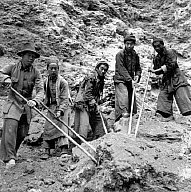 The French Yunnan-Vietnam Railway Construction Company recruited more than 60,000 Chinese labourers from all over China and there were over 3,000 French, American, British, Italian and Canadian engineers involved in the construction. Along this 465-km-long railway, 107 permanent railway bridges of various types were built and 155 tunnels excavated; 1.66 million cubic metres of earth and stones were dug out and over 3,000 temporary bridges and haulage routes were built. The difficulties encountered were beyond the imagination of the decision-makers in Paris. The climate was sweltering, particularly around the Nanxi River valley area, where summer temperatures could exceed 40 centigrade; it was humid and oppressive, and infections from tropical diseases and plague were always possible. Statistics show that during those six years, 12,000 people died and are buried alongside the 465km of railway. 10,000 of these died in the Nanxi River valley, most of them Chinese labourers who gave up their lives in order to earn a living. There were also several hundred Frenchmen and other foreigners, drawn from afar by this railroad, who never made it back to their native soil. 3. The Disposition of the Beyer-Garratt Locomotives from East Africa. Whatever the intention of the Kenya Uganda Railway (KUR) in sending their locos to Indo-China, it seems that they will have ended up on the French-owned line from Vietnam to Yunnan. There is some supporting evidence for this …..
“although Charles Small in “Far Wheels” has a chapter on the KUR/EAR, he does not deal with these Garratts. The roster info is truncated as Small notes that this info was given in the Railway Magazine. He does not mention the date but it must have been prior to 1959, the date of his book. There is a distant shot of a Garratt in service on the Yunnan Railway in “Chemins de Fer de la France d’Outre-Mer” (p131). After Pearl Harbour, there was good reason for Britain to help out with motive power for the (essentially French) Yunnan Railway but in 1939 it does not seem so likely and indeed, according to Chang Kia-Ngau, Britain was still minded to take note of what the Japanese thought of potential unfriendly actions such as providing anything that might be construed as military aid to the Chinese. http://bumali.com/03expeditions.shtml, accessed on 23rd June 2018. Archibald John Little, The Far East, The Far East Cambridge Library Collection – Travel and Exploration in Asia Edition illustrated, reprint, reissue, Cambridge University Press 2010, p124. https://en.m.wikipedia.org/wiki/Yunnan–Burma_railway, accessed on 23rd June 2018. “TOY railway”. The Northern Standard. Darwin, NT: National Library of Australia. 8 December 1939. p. 15, accessed on 23rd June 2018 & Construction Miracle: China’s Yunnan Burma Railroad. Royal Arch Gunnison, San Francisco Chronicle, Thursday, 27th November 1941. 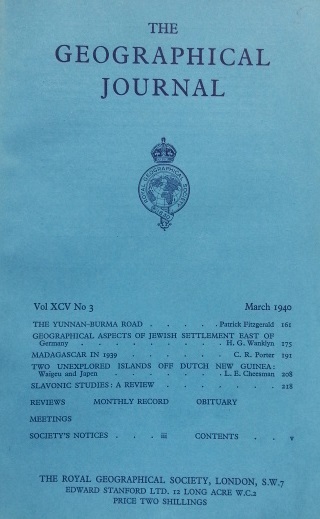 The Yunnan-Burma Road; The Geographical Journal, Vol. 45 No. 3, March 1940, p161ff. https://en.wikipedia.org/wiki/KUR_EC1_class, accessed on 14th June 2018. Roel Ramaer; Steam Locomotives of the East African Railways; David & Charles Locomotive Studies. Newton Abbot, Devon, UK, 1974, p88. A. E. Durrant; Garratt Locomotives of the World (rev. and enl. ed.). Newton Abbot, Devon, UK, 1981, p177. 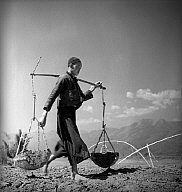 http://pro.magnumphotos.com/Catalogue/George-Rodger/1942/BURMA-WWII-Yunan-to-Burma-Railway-1942-NN143288.html, accessed on 24th June 2018.
http://www.highestbridges.com/wiki/index.php?title=Nami-Ti_Railway_Bridge accessed on 24th June 2018. Jean-François Rousseau; “An Imperial Railway Failure: The Indochina-Yunnan Railway, 1898–1941;” Journal of Transport History, Vol. 35, No. 1, June 2014. H. Whates, The Politician’s Handbook, Vacher & Sons, 1901, p. 146. Clarence B. Davis; Kenneth E. Wilburn Jr.; Ronald E. Robinson; “Railway Imperialism in China, 1895–1939”. Railway Imperialism. Westport, Connecticut: Greenwood Press, 1991. p159. A Picture Album of Steam Locomotives in China, 1876 – 2001. China Rail Publishing House. William D. Middleton; Yet There Isn’t a Train I Wouldn’t Take: Railway Journeys, Railroads Past and Present Series, Indiana University Press, 2000. p189. Wayne Arnold; “This Train Beats Walking (Sometimes);” New York Times, 3rd December 2000; https://www.nytimes.com/2000/12/03/travel/this-train-beats-walking-sometimes.html, accessed on 24th June 2018. 滇越铁路徒步第一程（昆明——宜良） (A walk along the Kunming-Vietnam Railway. Part 1: Kunming-Chenggong); http://www.mafengwo.cn/i/856012.html, (Chinese), accessed on 24th June 2018.
https://en.wikipedia.org/wiki/Kunming%E2%80%93Haiphong_railway, accessed on 24th June 2018. 昆明铁路局修竣63辆米轨平车投入国际联运, 4th May 2015 (Chinese), accessed on 24th June 2018. “上半年中越米轨铁路国际联运增长106.9% (The first six months’ international freight volume on the meter-gauge China–Vietnam railway has increased by 106.9% [compared to the previous year])”, 新华云南 (Xinhua Yunnan), 4th August 2016 (Chinese), accessed on 24th June 2018. Yunnan’s First Fertilizer Train Bounded for Vietnam, 19th March 2015, accessed on 24th June 2018. 胡, 晓蓉 (Hu Xiaorong); 张, 伟明 (Zhang Weiming) (2017-04-04), “中越米轨铁路国际联运运量持续攀升 (The volume of international shipments on the China-Vietnam meter-gauge railway continues to climb)”, 云南日报 (Yunnan Ribao) (Chinese, accessed on 24th June 2018. Lu, Hua (陆华); Guo, Weina (郭薇娜) (2015-04-24), 昆明铁路局：国际铁路联运开启云南货运新篇章 (Kunming Railway Bureau: An international railway link opens a new chapter in Yunnan’s freight transportation)(Chinese), accessed on 24th June 2018. Mallets built for export by North American locomotive builders. Includes reference to Yunnan/Burma railway 2-8-8-2 engines, accessed on 24th June 2018.
http://en.kunming.cn/index/content/2008-11/07/content_1656057.htm, accessed on 24th June 2018.
https://www.national-preservation.com/threads/uganda-railways.1150502/page-2#post-2179888, accessed on 24th and 25th June 2018.
http://cs.trains.com/ctr/f/3/t/267615.aspx, accessed on 24th June 2018.
http://www.passion-metrique.net/forums/viewtopic.php?p=419608#p419608, accessed on 25th June 2018. This entry was posted in Railways Blog, Uganda and Kenya Railways on June 24, 2018 by rogerfarnworth. According to Frédéric Hulot in “Les Chemins de Fer de la France d’Outre-Mer” the six KUR Garratts were purchased by the CIY in 1939 and unloaded in parts in October of that same year, but only saw little service before the line was cut in July 1940. While they were able to lift loads of up to 500 tonnes on the line’s steepest gradients, they were not popular with the crews as they could not be turned on the line’s turntables due to their length. à la Compagnie du Chemin de Fer Franco-Ethiopien. Nous avons, de plus, acheté au début de 1939 trois locomotives d’occasion et nous prévoyons l’achat de quelques locomotives articulées type Garratt, d’une puissance double de celles de nos plus fortes machines actuellement en service. durable, du Yunnan et de toute la Chine du Sud-Ouest. millions de francs en 1937. This is a translation of the above text. It is a statement, I think, written by the railway company in Yunnan province? “As the means of traction also became insufficient, we bought back, in last December, the 4 extra heavy locomotives we sold in 1935 to the Compagnie du Chemin de Fer Franco-Ethiopien. The increase of our fleet of rolling and traction equipment was necessary, not only to meet the exceptional needs of the current period, but also to condemn and contribute to the economic growth, which we believe sustainable, Yunnan and all of Southwest China. Transcription on the page 82 not 70, sorry. It does not say where the meeting was held, but the company’s seat and major shareholders were in Paris.